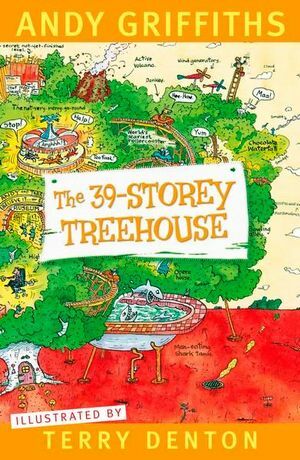 Today I will be writing about the 39 story tree house, which I completed last night in about 1 and a half hours. It is written by Andy Griffiths and illustrated by Terry Denton. It is a funny fictional series, with the 78 story tree house coming out in August. I like it, because there are a lot of weird and funny stuff in the books, such as flying beetroot. Anyway, I will make a haiku about it. get their important book done! like it? I know it doesn’t have a season in it, but it is a 5,7,6 syllable haiku. I would highly recommend this book to anyone between the ages of 5-15. There are also a lot of pictures, which I personally enjoy, and even though they are quite thick, they are sometimes wasted, like a lot of black pages in a row etc. Anyway, I really like the series, and I think that new books in the series will continue coming out for a long time. Like Them? I got all of the facts from wikipedia incase you were wondering, and I know I didn’t include 2 other books/series, but he only has 2 series! Anyway, I will see you next week, Matthew is over and Out. Hello guys, today our reading blog’s focus is “Events”. I’ll order the main events from 1-10. I’ll do Timmy Failure: Mistakes Were Made for this activity, as it’s a good fiction book and i’m rereading it now. Goes on about how lazy his polar bear is, and how annoying his mum is again. His school friends are doing weird stuff, like putting food in their mouths then shaking their heads, etc. Like it? Sorry it was late again, I just forgot. Anyway, Timmy Failure is a good, funny series, and I would highly recommend it to anyone. As always, watch out for my next post; C ya! Question 1 and 2 answers. I really enjoyed that. Did/would you think that was fun too? comment! Hi everybody, this is my 7th reading blog post, and first things first, I’ve changed the names of my posts. I am going to stop calling them”Reading Blog #1″etc, I’m going to call it the subject of the week’s name. Anyway, I think this week I can do my normal non-fiction books. I would choose ‘Ripley’s Believe it or not: Incredibly Strange!’. It is a fun and quirky book with lots of facts and some small stories about the achievements/people that do them. Around back, it has a small but enticing blurb. Like it? I do. Moving on to the design, it looks like it would hook you in, because it has all these cool pictures and looks a bit 3-D. The colour selection is bright and (was) shiny, which makes it look cool. I think this book would entice mostly everyone who picks his book up. Sorry if I didn’t do enough of the PMI. I couldn’t really think of anything apart from a lot of (pretty much the same as I’ve already covered) positives!! That’s it for this post, Matthew Out!! I am quite proud that we ended up doing a pretty decent job, considering that we were slow to work, and the timing was completely messed up. It was a challenge to make the timing correct without completely wrecking the animation and movement (it took a long time), and also to keep Donald together without showing the blue-tack. And also making Donald and the ninja jump. Next time I think we should organise more, because that would’ve made the whole job easier and quicker.